Most expats in Bali live in the well-known resorts of Sanur, Ubud, Seminyak and Canggu and these spots certainly have their advantages, being close to the airport and full of life. 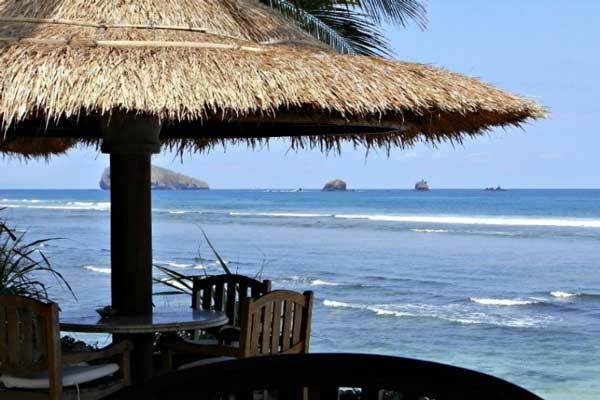 But if you’re after a quieter pace of life with less traffic and lower prices, here are three lovely, alternative places to consider for living in Bali. 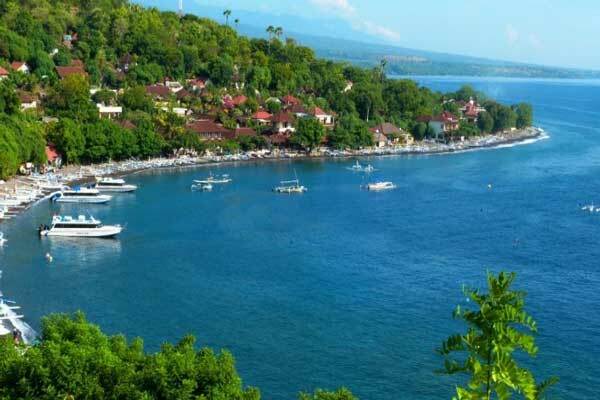 Amed is mostly known by divers as it’s situated on the east coast of Bali where there is a wonderful coral reef and fascinating shipwrecks to explore. Andre and I aren’t divers but we still really like this part of Bali. Amed is made up of a string of fishing villages, each with their own unique character and all in their own pretty bays which are dotted with bobbing boats. 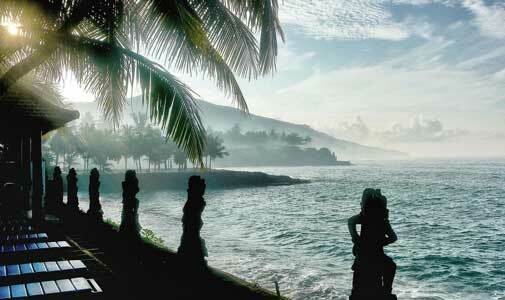 The scenery here is spectacular with amazing views of Gunung Agung volcano from the black sand beaches. The terrain is quite hilly, with tree covered slopes reaching down to the sea. The narrow roads are quiet except in the divers’ high seasons of April to July and October to November. You won’t find much nightlife here, but there are plenty of great restaurants along the beaches as well as yoga studios and some nice little boutiques. If you want deserted beaches, this is the place for you. You can buy a two-bedroom villa with pool in the Amed area for $180,000. There are fewer places to rent here than in the island’s hotspots but there is an Amed Facebook group which is a good place to look for accommodation. Otherwise, just get on the ground and ask around about long-term rentals. You’ll probably get a better bargain that way too. Pronounced “chandidasa”, this seaside town is about an hour’s drive on good, wide roads from the expat favourite of Sanur. There isn’t a lot happening here, which is great if you love the quiet life and although the expat community is small, it’s thriving. Spread out along the main road, you’ll find a few hotels and restaurants overlooking the ocean. My favourite is one where the owner has a collection of antique Chinese ceramics which rival any museum. Candidasa’s not for you if you want white-sand beaches, they’re black gravel here, but the views are stunning. The main road soon goes inland and there is a quiet area of town near the coast where many expats have built their villas. The town is also a fantastic starting off point for visiting the sights of east Bali such as the beautiful rice terraces and water gardens at Tirta Gangga, the smart, traditional Balinese town of Amlapura, the Taman Ujung Water Palace and the glorious landscapes around Sidemen. It’s also only 20 minutes away from the pretty little port of Padang Bai where you can pick up ferries to Lombok and the Gili Islands or just sit and have lunch at the lovely Colonial Hotel and watch the boats set off. Lovina’s first hotel was built in the 1960s by the last Raja of Buleleng who coined the name ‘Lovina’ as a contraction of ‘Love Indonesia’. Since then it’s become the primary resort area of north Bali but happily has retained its village feel and slow pace of life. Being about a three-hour drive from the airport through spectacular mountain scenery, Lovina has avoided most of the development that has characterised the south side of the island, although this could change if the proposed North Bali airport goes ahead in the next few years. 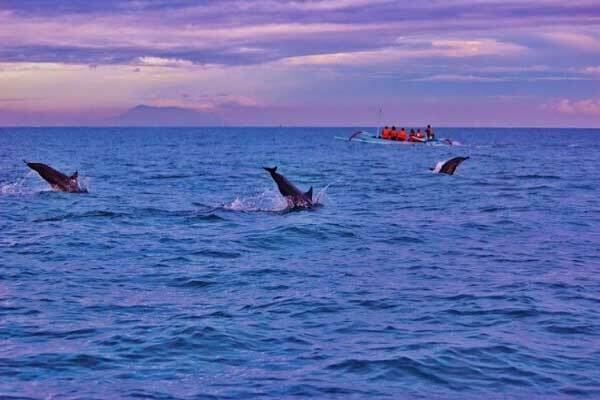 Lovina is made up of several villages along a black-sand beach known for dolphin watching trips. Years ago, Andre and I stayed at a really quiet little hotel on the beach and saw a Komodo dragon wandering through the gardens. Not far away are the lovely mountain village of Munduk where you can see as far as Java and the lake district of Bedugul. The nearest large town is Singaraja where you can visit traditional markets and stores. To the west, nature lovers can enjoy the pristine west Bali National Park and the ferry to Java is only an hour-and-a-half away.